With the decision to accept the the bail out, Cyprus now becomes the fifth country in the Eurozone joining Greece, Spain, Portugal, and Ireland to take on more unpayable debt. 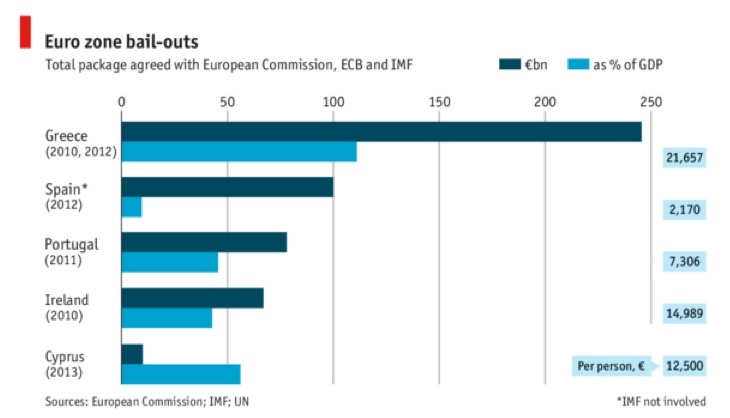 The following graph shows the size of the Cyprus bailout compared to the other countries and the size of the bailout in relation to the total size of their economy (GDP). At the very outset of the initial Eurozone sovereign debt meltdown there was heated discussion on whether Greece should accept that bailout or just remove themselves from the Eurozone, default on their debts, and devalue their currency. Longer term readers know that I have been in the second camp since the beginning. I have stated all along that their pain would be far greater at the outset, but after a short period of time they would find a bottom and begin to recover. With insolvent banks liquidated, their government debts either defaulted or monetized, and their currency drastically devalued, they would then have the ability to become competitive with the rest of Europe through lower priced exports and assets that were now relatively cheap. 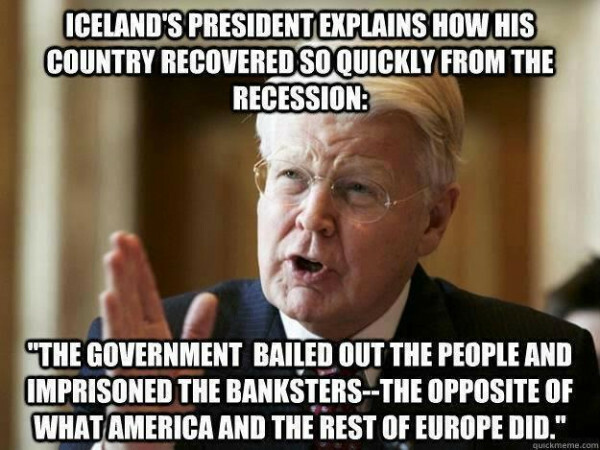 The only blue print we have of this tactic since the global financial crisis began in 2008 has been Iceland. They decided to let their banks fail and subsequently let their economy collapse. It was far more difficult for Iceland during 2008 and 2009, as their leaders had to make the tougher grown up decision for the longer term health of their country. The rest of the world looked at them as making the wrong decision, while I applauded it here. Iceland devalued its currency, cleansed itself of the toxic malinvestments, and is now growing under a strong and healthy foundation. Greece today is faced with the exact opposite situation. They have piled on more debt that can never be repaid in order to try and keep their farce sludging forward. Their leaders made the cowardly choice at every step along the way, and the country has not even begun a recovery because like most of the developed world it has still not allowed its insolvent system to cleanse. 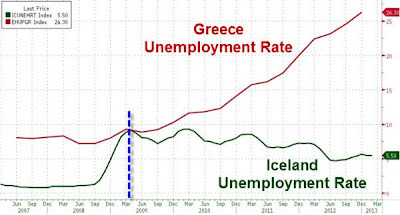 Unemployment in Greece now approaches 30% and youth unemployment approaches 60%. They are in a depression of the worst kind with no end in sight. The fact that the bank runs in Cyprus have not been worse up to this point with the capital controls in place will be looked at as a "victory" for other countries in Europe watching on. If you have your money in a bank in Greece, Portugal, Ireland, Spain, or Italy, you are insane. There is no other polite way to say it. Now Cyprus faces what will most likely be at least a 5 year contraction of their economy, which will continue to collapse under the weight of the new debt added in the bail out. When will a country say enough and make the correct decision to remove themselves form the shackles of the European Union? We may have the answer soon as the crisis moves back toward Spain, Italy, and France, where nothing has been resolved and grows worse by the day.